Hickory has traits that make it an incredible material. Hickory has been appreciated for its beauty, and strength. Hickory has been used to make furniture, carriage wheels, tool handles, ladders, sporting goods, and floors! As time goes on, we keep on seeing that it’s a great material to install for flooring. Hickory can be stained many colours to fit a desired look. In particular, Hickory takes well to brown tones, grey washing, ebony, jacobean and other stains. Hickory is a beautiful option in lower grades that are not perfectly clear. For example, knots of varying sizes add beauty and dimension to the wood. Medium sized knots add an organic feel to hickory, and pin knots add dimension. Sometimes, there are burls. Depending on what appearance a client may want to obtain, Hickory is the only option as it has a look that is multi-coloured. Boards tend to be either a reddish tone or blonde. When installed as a floor, the results are striking. Hickory has the ability to do very well with mild and deep stains. 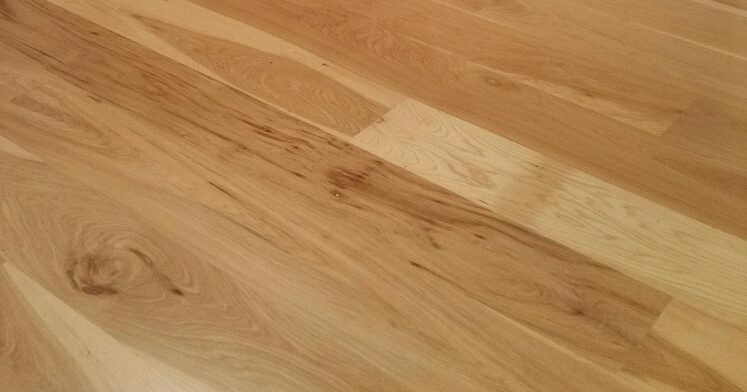 If the two-tone effect of Hickory is too strong, it can be regulated with most stains. Hickory plank flooring is tough! It has the highest ranking on the Janka scale making it the hardest domestic wood to use for flooring! This means it has high dent resistance. Hickory is a great option for dogs, children, active lifestyles, and for those who don’t want to needlessly worry about their floors. It’s suitable just about anywhere and can be installed in your place of business, home or condo. Hickory flooring does well with texture. We can mill it to have a flat top. We can also mill it to have sawn marks in the top. This gives a more rustic appearance. With a more rustic appearance, Hickory flooring becomes even more forgiving. Dents, scratches, scraps, wear and tear, and abuse are no match for Hickory that has textured saw marks. There are even options with regards to the appearance of a textured top floor. The saw marks can be sanded so that they aren’t rough, yet they are still visible. Another option is to fill the saw marks. What this does is give the illusion of a textured floor but in reality, it’s nearly flat as the filler has filled in the saw marks. The filler can be stained to blend into the wood, or it can be tinted to give a contrasting appearance. Would you like texture but you don’t want the saw marks? There are options! 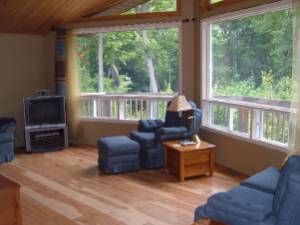 Initially, we install the Hickory plank flooring with a flat top. After installation and during the finishing phase, we can add more subtle texture. With this process, texture is added and makes the Hickory flooring more forgiving to live with, and adds to the unique beauty.